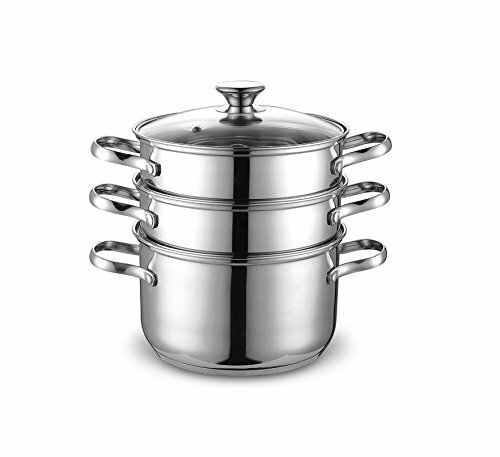 The Cook N Home 4 Quart/8-Inch Double Boiler and Steamer Set, Stainless Steel includes a 4 quart stockpot, steamer insert, double boiler insert, and a glass lid. Made of mirror polished stainless steel inside and out for appearance and easy cleaning. Encapsulated aluminum disc layered in the bottom allows for even heat distribution and prevents hot spots. Riveted handles are durable and comfortable. Tempered glass lid with steam vent to view cooking. Inserts have 3 steps and can fit 16/18/20 cm or 1-4 quart pots/pans. Induction compatible. Works on gas, electric, glass, ceramic, halogen, etc. Dishwasher safe. Measures: 12 in. length, 8.5 in. width, and 12 in. height.